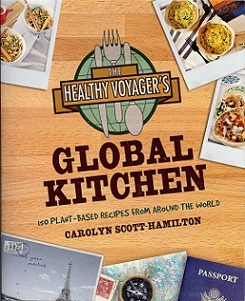 Carolyn is the author of The Healthy Voyager’s Global Kitchen: 150 Plant-Based Recipes From Around the World. Because Carolyn loves to travel the globe, she has embraced cuisines of the world and has tasted the exotic herbs and spices that make international foods so compelling. Her recipes, foreign foods she has veganized, take the reader to far away places. Call it armchair travel with one hand in the kitchen. Wash and peel sweet potatoes, then cube and boil until fork tender. Add cooked sweet potatoes in a large bowl. In a food processor or using an immersion blender pulse the soymilk and chipotle together. In a saucepan bring the soymilk and chipotle mixture to a simmer on low. Then add the maple syrup, sour cream, butter and salt and pepper to the milk mixture. Pour the soymilk mixture over the cooked sweet potatoes and again use the immersion blender or a hand mixer to mix the ingredients together. Cook the rice and lemon zest in a pan according to packet instructions, until tender. Drain well. Heat the onion and mushrooms and fry for 3-4 minutes, or until softened. Stir in the cooked rice, herbs and cranberries until well combined. Season, to taste, with salt and freshly ground black pepper. For the pastry, cut an 8-inch x 12-inch rectangle from the puff pastry. Spoon the rice mixture down the centre of the pastry. Bring the sides of the pastry together and seal with oil or melted vegan butter. Chill for 30 minutes. Bake in the oven for 30 minutes, or until crisp and golden-brown. To serve, place one slice of the Wellington onto each of six serving plates. Top with gravy.